It’s all about touch-sensitive Rubik’s Cubes, coloring books that play songs, and robotic hamsters that squeak when you touch them. A few years back, an article The Atlantic coined the term Baby Genius Edutainment Complex to describe Baby Einstein and other toys and educational products that prey on parental anxieties about their little ones growing up to score highly on the SAT, get into an Ivy, and land a great job. That market shows no signs of contracting if the 2010 Toy of the Year Awards (which toy makers like to call the Oscars of the toy industry but you can call the TOTYs), handed out at the just-concluded toy fair in New York, are any indication. The 11 honorees include the Electronic Toy of the Year, Technosource’s touch-sensitive Rubik’s TouchCube, which lights up when you play with it and includes a built-in solver so that kids can learn how to do the impossible (for me, anyway). There are also a couple of winners made by Crayola, including the Infant Toy of the Year, the Crayola Beginnings Color Me a Song game, which plays country and salsa music at various tempos depending on how quickly little Picassos are drawing. 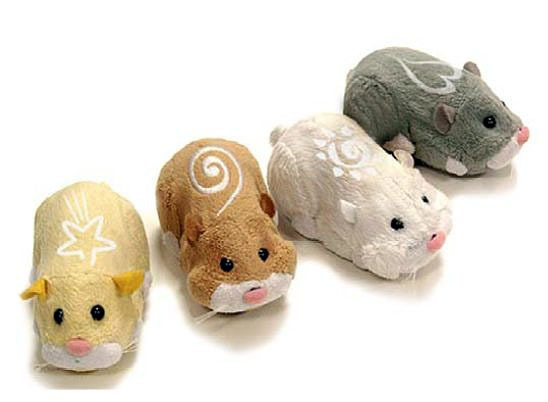 The wildly popular Zhu Zhu Pet Hamster, an interactive robotic pet that squeaks when you touch it and knows where in its hamster habitat it is, won Toy of the Year as well as two secondary prizes. One of the hottest toys of the holiday season, it survived a lot of adversity to get to the Toy of the Year stage, beating back a consumer advocacy’s charge that it contained a toxic chemical. There have also been problems with kids’ hair getting caught in the motorized hamster wheels, but maybe that’s another way the toy teaches kids about how the world works. One of the secondary categories Zhu Zhu won for was Girl Toy of the Year; the Boy Toy in the Year, meanwhile, was the Voltron-esque Bakugan 7-in-1 Maxus Dragonoid, a bunch of tiny transforming robots that stick together with magnets for to form a giant one. Transformers for boys, hamsters for girls–some things never change.